Danno Ferrin has released 0.1.0 of the JavaFX Gradle plugin. This release includes improved Scenic View support. Gerrit Grunwald has begun hacking on controls for JavaFX 8.0 (based on the in-development APIs available in the developer preview). You can see his work in his Enzo project. Speaking of custom controls, Hendrik Ebbers has put up part three of his ‘Custom UI Controls with JavaFX‘ tutorial. Dierk König has posted a good tutorial to help people new to JavaFX learn the basics. Speaking of Dierk, he has also posted a YouTube video that demonstrates the OpenDolphin portfolio demo application. Marco Jakob has two blog posts this week. Firstly, he has posted about slight improvements he has made to a DatePicker control (originally built by Christian Schudt). Secondly, he highlights the very useful snapshot feature of JavaFX to take screenshots of a running application. The Java Source blog has posted three video interviews with Jim Weaver, Gerrit Grunwald, and Martin Gunnarsson / Pär Sikö. 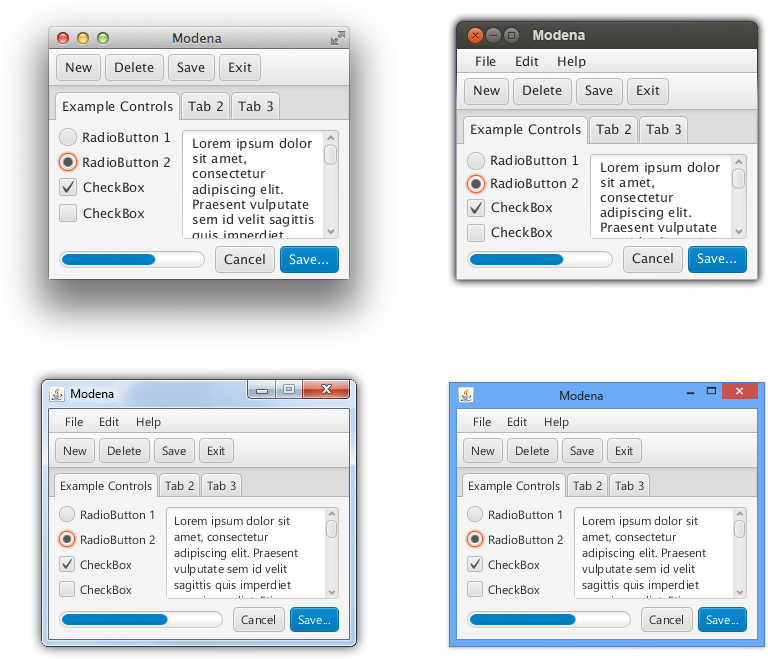 Pedro Duque Vieira has added CSS styling for the JavaFX ComboBox and ToggleButton controls as part of his JMetro project. The TiwulFX blog has posted on how to provide different colours to CSS charts. Anton Epple has a long post about writing a tile engine in JavaFX. Andy Till continues to improve his EstiMate software estimation tool. Leon Atherton has blogged about setting AffineTransform and Font in JavaFX and FXML. Steven Schwenke has posted about creating hover panes in JavaFX applications for context-specific actions. Robert Ladstätter has a number of posts that may be of interest to readers, including ‘Scala JavaFX Archetype‘, ‘Testing with JemmyFX, JavaFX and ScalaTest‘, ‘A sine wave with JavaFX and Scala‘, ‘2D Water Effects with JavaFX and Scala‘, ‘Lets go green and plant some trees‘ and ‘JavaFX Tree Visualization Part 2‘. José Pereda has posted about NXTBeeFX: “A JavaFX based app for Raspberry Pi to control a Lego NXT robot wirelessly”.